Over the years our Brenspeed B302 Stroker engine has became very popular among all types of customers. From drag racers to daily commuters our custom engine has exceeded our expectations. THE BRENSPEED B326 has taken our custom engines to a whole new level and trumps our B302 in power, displacement, and strength! We have designed the B326 at 9:8:1 compression using OEM Ford Cylinder heads to make the ultimate supercharged street or strip engine. You get the same race winning quality we have always included in our smaller B302, but more cubic inches, improved block strength, and MORE RAW POWER. The Brenspeed B326 for the 2005 to 2010 Mustang is built right here in our start of the art facility, professionally packaged, and crated to ship directly to you! Just like every product we sell at Brenspeed, if the job is to big for you to tackle, make the trip to our Facility. Stay for free in our Brenspeed guest house, and let our professional team perform the installation for you. The Boss 5.0L Block is cast in Ford�s Cleveland plant and shipped to Brenspeed for final prep. Ford designed this block with a proprietary iron mix to yield the strongest possible casting strength yet greatest consistency possible. The freshly cast block is prepped, machined, and quality checked to assure each and every block meets our specifications. Kellogg crankshafts are made in the USA and machined in Jackson, Michigan. They feature oil holes that intersect shallow oil hole pockets in the main bearings to help maximize bearing surface on the mains and improve oil flow to the rods. Fillet rolled to increase strength & OD induction hardened to provide maximum wear resistance. Two step polishing process for the rod and main journal surfaces. Beware of imported crankshafts that offer a low price but are not made in the USA! Kellogg crankshafts has been family owned and operated since 1956! Manley manufacturers these connecting rods from 4340 forgings. They are Heat treated, stress relieved, shot peened, and 100% magnafluxed. We have used thousands of Manley connecting rods over the years without failure and is our choice of connecting rod in the B326 stroker! CP designed our B326 pistons (9:8:1 compression) with 5 things in mind. Tighter clearances, less noise, better ring seal, more power, and more durability than other brand pistons on the market. The forgings were designed using advanced 3D modeling which allows CP to check thicknesses and weights before machining enabling them to produce the strongest yet lightest piston possible. Once designed they are machined on a 5-axis CNC machine while computerized electronic inspection equipment confirms they are manufactured to the tightest tolerances in the industry. Our B326 feature the Clevite 77 TriArmor rod bearings. These bearings feature a sophisticated blend of materials that offer extraordinary protection and lubricity. The enhanced wear characteristic of TriArmor bearings increase bearing life in race and high performance street engines. Combine that with Clevite TriMetal technology and you have a bearing that has great protection during start up, reduced friction and drag, ability to withstand extreme temperature and pressure, and extraordinary strength and durability. Our Speed Pro Main Bearing kit uses materials and alloys engineered for the demanding applications your B326 may be put through. Speed Pro has tailored their bearings to withstand punishing racing conditions. They are proven winners in NHRA, NMCA, NMRA, Nascar, and IHRA. Ready for another source for high end OEM quality custom engines? We are now shipping our B302 supercharger engine. 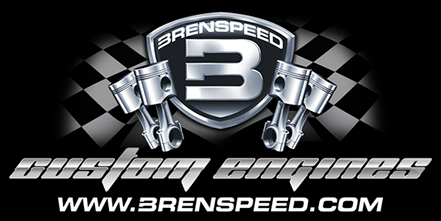 Our B302 (Brenspeed 302 CID) is a 4.6L stroker containing the best parts on the market. The internal components we are using have already been tested in extreme high horsepower applications. These engines are in stock ready to ship with no wait time. Our B302 is not only the best priced high quality engine on the market but they are built and in stock ready to ship. More On The B302: The B302 supercharged short block pricing is $3895! This is an amazing price for the quality of engine we provide. All new aluminum block, Brenspeed spec CP Pistons, Brenspeed spec Manley rods, and none other than a Brenspeed spec Kellogg crank. Our engines are assembled here at Brenspeed in our state of the art engine clean room. Shipping: Our B302 engines ship to you via UPS freight. We can ship them to your work, your house, or about anywhere you need it shipped. Shipping cost vary depending on your location.